Archaeology and Egyptology in the 21st century | Current archaeological fieldwork, survey, technology and opinion, with a particular focus on Egypt. In early 2017 I began thinking seriously about beds and bedrooms in ancient Egypt. I had just been asked to review Nadine Moeller’s recently published book The Archaeology of Urbanism in Ancient Egypt: From the Predynastic Period to the End of the Middle Kingdom and heard a fascinating lecture by Manon Schutz about beds in ancient Egypt at the Essex Egyptology Group. I found both challenged my assumptions about how we view domestic space, particularly ‘the bedroom’ and what these things meant to the ancient Egyptians. Rectangular rooms with some form of ‘niche’ at one end, have long been identified as ‘bedrooms’ in Egyptian houses. A series of sloping mudbrick sleeping platforms found at Giza in the settlement of the Pyramid builders confirm that some of these niched rooms were used for sleeping (An image is available on page 73 (Fig 33) of the original field report). However, the idea of the ‘bedroom’ as a private place for sleeping, is very much a modern construction and probably isn’t applicable to the ancient Egyptian context (Manon Schutz, 2017, presentation to Essex Egyptology Group). Bedrooms might, therefore, have been used for a great many activities, including public ones such as meeting visitors and transacting business. The mudbrick beds from Giza included in Moeller’s (2016, 203) discussion of Old Kingdom settlements are reminiscent of the traditional Chinese ‘Kang’, a brick platform warmed by hot air from a stove (Fig 1. left). Kangs were multifunctional structures, that were also used for sitting, receiving visitors and general living and it is possible that Egyptian beds and bedrooms were equally multifunctional. Moeller (2016, 377-380) notes that ‘multifunctionality’ is a major feature of Egyptian houses and Manon Shutz emphasised that this is also true of beds, which could be used as seating and were status indicators (Fig 2). Taken together the multifunctional role of the bed and the bedroom can also be related to the more general layout of Egyptian houses. Moeller (2016, 194; 343) describes a core set of rooms in Old and Middle Kingdom houses. The precise layouts of the rooms vary over time and the number of rooms increases with the size of the houses, but throughout the periods they are always laid out to obscure visibility and restrict access into the innermost rooms. This is also clear in the layout of New Kingdom houses at Amarna (Fig 3). Fig 3: House Q44.1 at Amarna, from the transverse hall, with the main hall behind it. Entrances behind the main hall lead to more private rooms, including ‘bedrooms’. If bedrooms were more public spaces than we have been conditioned to think, then official business might have been transacted in the ‘bedroom’, perhaps with the owner sitting on the bed where he could demonstrate his wealth and status. The petitioner, messenger, or fellow official would be lead through the maze-like series of rooms, perhaps decorated to impress visitors, along the indirect route prescribed by the layout of the core rooms. The convoluted layout of the rooms suggests that your access to the interior of the house was directly proportional to your status, with lower status visitors perhaps dealt with by lackeys or subordinates in the outer rooms. Those of sufficient importance would be ushered through to the ‘bedroom’ to see the official seated in his (or perhaps ‘her’, where we are talking about a queen, priestess or another powerful woman) bedroom/office, perhaps on his own bed. There is relatively little evidence available to reveal precisely how ancient Egyptian houses were used, so proving hypotheses about where guests were received and business transacted is difficult and it is often possible to construct an alternative scenario. Personal preference, questions of decorum and practical considerations might also have been considerations. But by challenging the centrality of our ideas about room use, privacy and social dynamics, it’s possible to rethink Egyptian civilisation on its own terms rather than through the lens of our experience. To this end, Moeller’s book is a challenging and thought-provoking contribution to our understanding of Egyptian settlement archaeology. You can read my full review of Nadine Moeller’s The Archaeology of Urbanism in Ancient Egypt: From the Predynastic Period to the End of the Middle Kingdom for free online at the American Journal of Archaeology. Manon Schutz’s lecture to the Essex Egyptology Group is reviewed in their June 2017 Newsletter, where you can also read an earlier version of my thoughts on this subject. Gilded bronze statuette in the Barcelona Egyptian Museum attributed to Akhenaten by its label. Author Photograph. The Barcelona Egyptian Museum contains many fascinating objects, some inspired presentations of Egyptian artefacts and two interesting exhibitions that further explain aspects of ancient Egyptian culture. My previous post (The Egyptian Museum of Barcelona) covers the highlights of the museum but only touched on the issues my visit raised concerning the presence of possible forgeries and the ethics of creating a modern museum from purchased antiquities. This post follows on from my previous review and another recent post about black market antiquities to consider the nature of purchased antiquities and the implications of them for reviewers and researchers of museum collections. In the Barcelona Egyptian Museum is a small gilded bronze statuette that is attributed to Akhenaten by its label (left). My instagram image of this particular artefact prompted a number of disbelieving comments. There are several aspects of the style of the statuette that are suspicious, such as the way the kilt drapes over the thighs. The date is also incongruous. I have yet to identify a single comparable statuette of this type from the Amarna period (so if anyone reading this can think of one, they are welcome to put a link or reference in the comments). Bronze statuettes are much more commonly associated with later periods of Egyptian history. In fact the Barcelona Museum also has a number of gilded bronze statuettes of divinities dated to the Late Period, such as a gilded bronze statuette of the goddess Neith (below right), that the object label attributes to the XXVI Dynasty (i.e. within the Late Period as expected). All these aspects combine to raise doubts about the authenticity of the Akhenaten or, at the very least, its attribution. One alternative to an out-and-out forgery is that the statuette was originally of an unnamed Late Period pharaoh, later falsely identified as the famous Akhenaten by an unscrupulous antiquities dealer to raise its value. Gilded bronze statuette of the goddess Neith. Identified as XXVI Dynasty. Author Photograph. The reaction to my Instagram post about the Akhenaten statuette was my first intimation that writing a blog about the Barcelona Egyptian Museum might not be straightforward. Having read the many questioning comments I wondered whether I should continue with my intended post. Various questions bubbled up. Was it ethical to write about objects that may be forgeries? What impact might it have on my reputation? How could I be fair the museum, while writing about the possibility of forgeries being on display? And should I even consider writing about a museum when most of the objects had been purchased so recently on the antiquities market, given that I am generally of the opinion that the purchase of legal antiquities is inadvisable at best and unethical at worst? The obvious solution would have been to leave well alone. I could not be criticised if I didn’t post anything. But that would deny me the opportunity to review the other interesting artefacts in the Barcelona Egyptian Museum. It would also be cowardly. The debate my image of the Akhenaten had provoked and my reaction to it, exemplifies the difficulties we experience in working with purchased and unprovenanced antiquities. If I simply ignored the problem I would be contributing to the silence about these issues. This post is therefore an attempt to interrogate the questions and anxieties unprovenanced antiquities raise in the minds of researchers and how these influence our reactions to and treatment of such objects. The false door and two side panels from the VI Dynasty tomb-chapel of Iny in the Barcelona Egyptian Museum. Author Photograph. As I mentioned in my previous post, most of the object labels in the Barcelona Egyptian Museum do not give details of the provenance or the origin of the artefacts. Research on the museum’s website and wikipedia page revealed that the collection was a recent creation, with most of the artefacts purchased on the antiquities market since 1992. Further evidence of the recent origin of the collection came from the bibliographies of the artefacts from the Barcelona Egyptian Collection that featured in the Moda y Belleza catalogue of the exhibition of the same name (D’Amicone 2011). Many of the objects currently in the museum featured in the catalogues of the major auction houses from which they had been purchased from 1992 onwards. Since most artefacts purchased on the antiquities market originate in private collections and very few come from archaeological excavations, they rarely come with detailed archaeological provenance. It is almost impossible to identify the precise house, tomb or temple context for a given object, and it may also be difficult to determine which site, region and period an artefact came from. At best the occurrence of named individuals on artefacts sometimes allows them to be associated with other objects, a known tomb, temple or site. This is the case with the VI Dynasty false door stela (image above) and reliefs of Iny in the Barcelona Museum, which were identified as part of Iny’s now lost tomb-chapel and associated with further reliefs from the same structure that are now in other museums. The multiple XII and XIII Dynasty stela now in various private collections and museums but originally from the Abydos North Offering Chapels (Simpson 1974) represent a more extensive example of the same process of archaeological detective work. But detectival methods of assigning provenance are usually only applicable to inscribed objects and even if an object can be associated with a site or assemblage it is rarely possible to reconstruct its precise archaeological provenance to the level of a findspot or room. Even though we know that the false door and relief fragments in the Barcelona Museum come from the tomb-chapel of Iny, we do not know where that tomb-chapel was. We might suspect that it was in the Memphite region, but we cannot know precisely where. We do not know what else formed the tomb-complex or what other archaeological structures and artefacts might have been associated with it. For most artefacts that lack archaeological provenance, the situation is even worse. Usually the only contextual information available is a rough date and perhaps the general site or region where the artefact originated, as determined by stylistic comparison with similar objects of known provenance. Artefacts that lack archaeological provenance are inevitably more likely to attract suspicions about their authenticity. Forgers have been active as long as there have been collectors, but a number of high profile recent cases indicate that forgery is increasing in ‘growth’ areas of the antiquities market including religious artefacts, biblical archaeology (Burleigh 2008) and (naturally) Egyptian objects. Recently purchased artefacts are not the only potential forgeries. The proposition that the British Museum’s statue of Tetisheri is a forgery demonstrates how an artefact accepted as genuine for decades can later be questioned. Given the varied origins of most Egyptian collections, it is probable that every one has at least one or two forgeries. But those with a higher proportion of purchased artefacts are likely to contain more forgeries. While scientific testing can sometimes resolve questions of authenticity, they are more often a matter of expert opinion and can therefore provoke considerable debate among experts with different views. That there is still debate about the authenticity of the statue of Tetisheri, demonstrates the problems of discerning forgeries from genuine antiquities. Gaudily painted pottery coffin mask with female face. Dated to the New Kingdom according to it’s label. A similar mask has recently been offered at auction. Author Photograph. An artefact is most likely to be accepted as genuine if it is typical of its period and material in style and execution. The bronzes of (supposedly) Akhenaten and Neith, which began this post exemplify this feature of archaeological research. Since a large number of Late Period statues of deities are known the Neith is much more easily accepted as genuine than the incongruous Akhenaten. However, there is no archaeological reason why one should be more genuine than the other if both are unprovenanced. The only difference is that the Neith conforms to our art-historical expectations, while the Akhenaten doesn’t. Unfortunately if we always suspect the unusual, and accept the familiar we risk dismissing genuine artefacts because they are different, thereby losing the information they could provide about the variety of Egyptian art and consolidating cliched ideas about the conformity of Egyptian artefacts. It would be ironic indeed if further research and scientific testing revealed the Akhenaten to be genuine, while the Neith was a forgery. Suspiciously poor quality or just not typical of ‘Egyptian art’? Roman pottery coffin dating from the 3rd to 4th century AD (E-620). Purchased from Christies in 2002. Author Photograph. Another facet of this problem is the tendency to assume that poor-quality or ‘unEgyptian’ artefacts are fake. Amongst the coffins in the Barcelona Museum are two painted faces from pottery coffins, one male and one female (image above left). These are exactly the kind of artefacts that might be written off as fakes, but an almost identical female mask was recently offered for sale at auction. There is still the possibility that all three masks are forgeries, but it would be unwise to write them off without further research just because they are a little outside the norm or do not match our expectations of Egyptian art. An astonishingly hideous 3rd to 4th century AD Roman pottery coffin (E-620) raises similar questions and doubts (right). There is no doubt it is a truly ugly object to our eyes, but just because it doesn’t conform to our expectations does not necessarily make it a fake. It is entirely possible that the owner was satisfied that the coffin would perform its function, and utterly uninterested in its (to our minds) aesthetic deficiencies. The scientific discovery of poorly formed, badly decorated or illiterately inscribed artefacts demonstrates that the requirements of ancient Egyptian purchasers were not necessarily the same as ours. The pseudo-hieroglyphs on the Late Period coffins excavated from Iurudef’s tomb at Memphis were presumably thought sufficient by their owners, but could easily have been thought a modern forgery if they had not been scientifically excavated (Martin 1991, 144). Bead dress in the Barcelona Egyptian Museum described as IV Dynasty (E-843) by its label. Note the winged-scarab motif on the bodice. Author Photograph. In the Barcelona Egyptian Museum is an artefact (E-843) described as ‘Dress composed of beads. Faience and turquoise. Old Kingdom’. There are several curious aspects of this artefact that could lead to the assumption that it is a forgery. Firstly, unlike the excavated Old Kingdom bead-net dresses in the Petrie Museum and the Boston Museum of Fine Arts the Barcelona dress only appears to cover the front of the person. Given the structure of the shoulder straps and bodice there is insufficient bead netting to cover the sides and back of a human. The design of the dress, combining broad shoulder straps with a long skirt, is generally consistent with the excavated Old Kingdom dresses, but the inclusion of a winged-scarab motif in the bodice (see feature image above the title of this post) strikes a discordant note, both because it is a funerary motif and because such beaded images are more generally associated with the Late, Ptolemaic or Roman periods of Egyptian history, rather than the Old Kingdom. Given these discrepancies it would be very easy to write this off as a forgery, but it is much more likely to be a recreation of a dress using ancient beads, probably from several different periods, made by some antiquities dealer to increase the value of his merchandise. Indeed the Moda y Belleza catalogue (D’Amicone 2011, 195) comes to this exact conclusion, but because this is not reflected on the object label it would be easy to draw the wrong conclusions. Unfortunately the uncertainty that is provoked by the dissonance between the nature of the object and the information on the label does not just affect this one artefact, but could potentially cause the viewer to question the authenticity of others as well. None of the artefacts in the Barcelona Egyptian Museum which have provoked concern have been demonstrated to be forgeries, and indeed many (if not all) of them may yet prove to be genuine. However, the uncertainty that is provoked by objects like E-843 or the incongruous Akhenaten does not just affect the reception of those artefacts. By extension it can lead the suspicious researcher to question other objects in the same collection or similar artefacts elsewhere. As I experienced when considering how to write about the artefacts in Barcelona, even the possibility of reviewing fakes can lead to anxiety on the part of a researcher about the ethics of their actions, the reactions of their peers and the impact of their research on their academic reputation. This anxiety is not without cause. There is a general sense that the presence of forgeries in a collection should be a source of shame. This might be justified if artefacts are envisioned as primarily economic assets, where the sale of a forgery is tantamount to fraud. But it seems a bizarre position to take when in almost every other aspect of archaeological discourse we emphasise the scientific and historical value of artefacts and rail against their treatment and sale as economic assets. If we truly believe an artefact is of purely scientific value, then finding a forgery is like locating an erroneous reading in a set of scientific data. It is useful to identify and exclude it from our research, but should otherwise cause minimal anxiety. This is not to minimise the risk of forgeries skewing archaeological discourse, but it does seem that our reactions to them can be out of all proportion to the risk they pose to scientific enquiry. Perhaps more importantly the treatment of forgeries and potential forgeries as a source of embarrassment and shame precludes honest discussion of this problem amongst both museum and archaeological professionals and prevents us from exploring the impact of forgeries upon our research. Part of this impact is the effect uncertainty has upon research. As I have demonstrated above it is incredibly easy to doubt the authenticity of unprovenanced and purchased artefacts, particularly when they do not have many obvious parallels or do not fit with our preconceived ideas about Egyptian artefacts. This has a significant impact upon our understanding of Egyptian culture and our ability to study unprovenanced artefacts. Almost any artefact that has been purchased (whether recently or many decades ago) without clear archaeological provenance might be suspected. But since the more typical an object is the more likely it is to be accepted, genuine but atypical or unusual artefacts run a greater risk of being dismissed as forgeries. On the other hand fake but typical objects might well be included in catalogues and typologies because they fit our preconceptions. Inevitably this risks skewing our research towards the ‘typical’ and prejudicing us against the unusual. At the same time anxiety about publishing or displaying an artefact that later turns out to be fake can inhibit the research and display of genuine but unusual artefacts. One obvious way to eliminate the anxieties associated with unprovenanced antiquities is to avoid them altogether individually and corporately. This is an admirably ethical position, but like many noble ideals it also raises some practical questions. Should we just ignore collections like the Barcelona Egyptian Museum, either from anxiety that it may include forgeries or ethical objections to the recent purchase of the artefacts? If the ethical objection is foremost, then how long must an artefact have been in a museum before we can legitimately engage with it? There are many thousands of purchased antiquities that reside in museum collections around the world, including many important artefacts held by major museums. Can we arbitrarily decide that research into the Barcelona Egyptian Museum artefacts is unethical, while working with museum collections that include artefacts purchased during an earlier era? Is it ethical to ignore artefacts that may provide important archaeological evidence to confirm or challenge our research just because they were purchased? As I discovered when visiting the Barcelona Egyptian Museum if we decide to ignore purchased artefacts then we potentially lose important evidence and ignore interesting artefacts, but when we engage with them we must wrestle with ethical concerns and fears about accidentally including forgeries in our research. I cannot provide definitive answers to these questions but perhaps it is time we began discussing these ethical and professional concerns more openly? As we do so we should remember that all museums include purchased antiquities, that any museum or expert can be deceived by fakes and it is highly probable that every museum has at least a few forgeries hiding away in the stores (and sometimes even on display). While no-one would argue that we should accept the casual display of known fakes, we should recognise that forgeries occur and can be difficult, time-consuming and contentious to identify. The only way to manage unprovenanced artefacts and suspected fakes is to open an honest discussion about forgeries within Egyptian collections, the difficulties inherent in identifying them and the impact of forgeries and unprovenanced antiquities upon our research. Negotiating the ethical and professional questions raised is never going to be easy, but if we can be honest about these issues we can develop productive debates and advance our research. Burleigh, N. 2008. Unholy Business: A True Tale of Faith, Greed and Forgery in the Holy Land. Smithsonian. Martin. G. T. 1991. The Hidden Tombs of Memphis. London: Thames and Hudson. Simpson, W. K. 1974. The Terrace of the Great God at Abydos: Offering Chapels of Dynasties 12 and 13. New Haven. I am indebted for Manon Schutz of Oxford University for information about several of the artefacts, to David Blogg for the photo of Tetisheri when she was still on display and to Roland Enmarch for the reference to the tomb of Iurudef. I am also grateful to all of those who commented about these artefacts online and especially to Luca Miatello, Dario Nannini, Carlo Rindi Nuzzolo, the online members of the Facebook groups Sussex Egyptology Society Unofficial Page and the Coffin Club for their suggestions regarding possible parallels and dates for some of these artefacts. I am also grateful to all the friends, colleagues and museum professionals who have engaged with me on this subject thorough constructive discussions about forgeries and the ethics of studying purchased antiquities. Long may these debates continue to inform professional discourse. Several GIS platforms now offer apps that synchronise GIS-based fieldwork between your computer and your phone or tablet. With options to add differential GPS equipment to your mobile GIS kit and the capacity to take your basemaps and other data with you into the field, mobile-GIS eliminates the disconnect between data capture and GIS. So how do the latest mobile-GIS apps measure up in the field? Here I review two that I tested recently during fieldwork at the classical site of Olynthos, during ongoing fieldwork in Greece. Programming the differential GPS on the terrace of the Marsam Hotel, Luxor. There have long been efforts to replace large and complex survey kit with smaller handheld devices. Until recently these typically involved either a substantial cost for the procurement of specialist hardware and software (such as the Leica Zeno and ESRI ArcPad) or experience in the management (and often programming) of open-source data solutions (such as many described in this discussion in GIS Stack Exchange). If you didn’t have the financial or programming resources to use these, then you were stuck with combining survey equipment, like total stations or differential GPS (see image left) with several different software programmes in order to create, process and import your data in a GIS (Geographic Information System). Once fieldwork data was incorporated into the GIS, it often required further processing to produce GIS-friendly layers for analysis and presentation and if the data was collected by a non-GIS specialist there were many opportunities for misunderstandings about the format required for GIS compatibility, resulting in stress and additional delay for one or both parties. The advent of mobile phone and tablet compatible mobile-GIS apps has opened a range of new possibilities for recording fieldwork directly in a mobile-GIS platform, synced to your online or desktop GIS. During recent fieldwork at the site of Olynthos, Greece I trialed two different mobile-GIS apps ArcGIS Collector and QGIS QField on my Samsung Galaxy tab S2, running Android 7. The Olynthos Project is an interdisciplinary research project in northern Greece directed by Lisa Nevett of the University of Michigan, Zosia Archibald of the University of Liverpool and Bettina Tsigarida of the Ephorate of Pella. The project combines the excavation of houses on the north and south hills of the classical town, with field surface survey of the surrounding countryside and various scientific analyses (Nevett et al. Forthcoming). The project has typically used total stations for recording on site and printouts of Google Earth for identifying surveyed fields, with data from both sources incorporated into the project GIS in subsequent stages. Tablet-based mobile-GIS survey is not appropriate for precise recording of archaeological features in the excavation trenches, as GPS units integrated into tablet computers are only precise to c. 2.5-5m. But once combined with a satellite image basemap, this level of precision is perfectly acceptable for recording surveyed fields in the surrounding countryside or surface collection in grid squares on the unexcavated parts of the site. The Olynthos Project began using ArcGIS Collector for surface survey following initial development of the Olynthos Project ArcGIS Online group and ArcGIS Collector maps by Peter Knoop and Caitlin Dickinson of the University of Michigan. The recent field season in July 2017 gave me the opportunity to test ArcGIS Collector against QGIS QField during archaeological fieldwork. ArcGIS Collector and QGIS QField are essentially simplified versions of their big brother desktop GISs, optimised for field data collection on a small mobile device with limited connectivity and processing power. Both apps operate on similar principles. You produce layers in your desktop GIS, convert them and upload them (directly or via the web) to your mobile device. The Collector and QField apps then run these ‘mobile’ versions of your GIS projects enabling you to a view, and create GIS layers in a format that is suitable for smaller screens and simpler for mobile devices to process. Both apps are designed for creating data in the field using the device’s GPS or a separate unit compatible with it. Both raster and vector data are supported and require processing for inclusion in the mobile app, raster data usually requires tiling to ensure it displays efficiently. Despite their many similarities there are several significant differences between ArcGIS Collector and QGIS QField, not least of which is that Collector is proprietary and requires you (or your organisation) to have an online subscription, while QField is free and opensource (like all QGIS products). Since many archaeologists, archaeological units and universities already have ArcGIS licenses and online subscriptions ArcGIS Collector is likely to be a significant player in future mobile-GIS for archaeological fieldwork. It requires you to have an ArcGIS Online account, through which the uploading and downloading or your mobile GIS data is managed. Setting up your Collector app is therefore a staged process, first you must share the layers you want to use to your ArcGIS Online account. Then create a map in your online account with a basemap (either ERSI ArcGIS imagery or your own tiled raster) and the layers you want to see or edit in the field. Finally you download that map to your Collector app on your mobile device. This process is a little cumbersome and confusing, particularly for those who haven’t used ArcGIS Online before. It’s easy to upload a layer but then fail to share or publish it correctly for you or others to view or edit it in Collector. This can be irritating, but there are online help pages and the usual forums (such as the ever-brilliant GIS stack exchange) and once you’ve created one map for Collector, familiarity makes the process a lot easier. The ArcGIS Collector interface, showing the point data overlaid on ESRI ArcGIS imagery, with the attributes (including photo) on the right. The good news is that once you’ve grasped the online part of the process, the interface (above) is clean and easy to use and using the app in the field is incredibly simple and straightforward. Once the app is linked to your ArcGIS Online account it identifies all the maps you and others in your organisation/group have created and offers you the opportunity to collect data using them. You can operate Collector in two modes. If you just click on a map in Collector, it loads the map directly from your ArcGIS Online account via wifi or mobile data. This is straightforward, but if you don’t want to use mobile data or the connection is slow, then it’s a pain. Alternatively you can click ‘download’ on the map and download a section of it to Collector for offline editing. With a downloaded map you can use a basemap from your ArcGIS Online account, from ESRI ArcGIS imagery or from a raster on your device. You pick the geographical area you’re working in and the level of detail you need for your fieldwork and Collector will download just that area of your AcrGIS Online map so you can work offline, saving you time and mobile data. Once you finish recording in the field you can sync your downloaded map, uploading all your edits to their respective layers in ArcGIS Online (if you use Collector without downloading, the syncing occurs in real time via wifi or mobile data). You then return the edits to your computer by opening ArcGIS Online in your desktop GIS and adding your edited layers. The process within the app is generally slick and comfortable but a major issue with Collector is that it doesn’t currently support snapping. This necessitates various topological checks and editing of your data in ArcGIS desktop after you’ve downloaded it. I found this to be a serious deficiency in the ArcGIS Collector format, which is all the more surprising given that Collector is substantially older than QField, where snapping is straightforward to set up. Overall I found Collector a straightforward app to use. Although the need to run the data through ArcGIS Online is slightly irritating and predisposes the process to additional errors, this is typical of a platform which is trying to serve a great variety of purposes across many industries. The Collector app isn’t perfect (the absence of snapping is a serious defect in my opinion) and crashed a couple of times, but performance definitely improved when I downloaded the maps instead of using them through mobile-data/wifi. For anyone using Collector I would recommend keeping the number of layers, particularly raster layers, to a minimum by only using the layers you absolutely need in any given map. You can also improve performance by turning your rasters into tile packages and transferring them directly from your desktop to your mobile device. When you download your map to the Collector app it is also advisable to limit the ‘Work Area’ that is downloaded to the minimum that is necessary to complete your fieldwork, as this will speed up the download and performance generally. QField is the opensource QGIS version of ArcGIS Collector. It’s relatively new and still in the experimental stage, so may have some bugs, although these will be worked out as researchers find and report them. One great advantage of QField is that all data preparation takes place on your desktop GIS and there is no need to upload anything to an online account. Instead you prepare your data in QGIS desktop (including symbology, snapping and attribute fields), package it for QField using the QFieldSync plugin (Note that you must be using QGIS 2.18 for the QFieldSync plugin to function correctly) and then physically transfer it to your mobile device (with a cable). This eliminates many of the irritations of the ArcGIS Online transfer process, but does mean you need to pay attention to the QField online documentation about where you should store your project folder on your mobile device (I found this stage a little confusing, but more information will undoubtedly come out as people use QField more). QField interface showing the active layer (on the left) with menu above it and the data frame in the centre with a drone image of the Olynthos hills and surrounding surveyed fields (in red). The attributes of the yellow-highlighted field can be accessed by clicking on ‘198’ in the right pane. On first look QField appears a little more confusing than ArcGIS Collector and the interface (see image above) is a little clunkier, but these are minor issues and will undoubtedly be resolved as development continues. Like ArcGIS Collector QField allows you to browse and view existing layers and create features. The workflows are typically clean and efficient, but unlike ArcGIS Collector you cannot edit the geometries of features that were transferred into QField from your desktop. You can only create and edit the geometry of new features. Although you can edit the attributes of existing features in QField, it is slightly disappointing that you cannot edit their geometries as it limits your capacity to edit previously created archaeological features based on new data obtained during your fieldwork. It’s not an insurmountable problem, but it is irritating. Hopefully this will change with further development. There are a couple of other minor issues with QField functionality. It’s frustrating that you cannot view features created outside of QField in vector layers set to ‘offline editing’. The advent of Android 7 has resulted in a bug in photo capture in the app (https://github.com/opengisch/QField/issues/133), which is currently being resolved but prevented me from taking photos in the app. However QField is still in the experimental testing phase and will undoubtedly improve with development. Given its stage development the quality of QField bodes well for the future of opensource mobile-GIS. As our current survey fieldwork does not require better accuracy than the c. 2.5-5m provided by the onboard GPS I haven’t attempted to use these apps with an external GPS device. If necessary it would be possible to improve the accuracy with any one of a number of additional GPS devices, as described in this blog. This would undoubtedly add to the amount of equipment (and expense) involved and might provoke more compatibility and processing issues to occur, but would permit mobile-GIS to be used for much more detailed recording. ArcGIS Collector and QGIS QField are very similar mobile-GIS apps and both permit a user to record data easily in the field, to a modest level of precision, and sync that data with their existing GIS using just a tablet or smartphone. Both apps significantly sped up data collection in the field and eliminated the need for additional data entry as records were transferred from total station or paper records to the desktop GIS. Currently ArcGIS Collector is the more developed and flexible platform, provided you can get access to it and are prepared to put up with the irritation of processing everything through ArcGIS Online. But QGIS QField is catching up fast, and has already surpassed Collector in some areas (notably the presence and ease of snapping) despite its experimental status. Although the occasional bugs might put some off QField, if you don’t have the resources for ArcGIS Collector, already have some familiarity with QGIS and are prepared to work around the occasional issue, QField is a great little platform that will only get better. In a few years’ time I can easily imagine using QField for preference if it continues to develop along its current lines. I am grateful to the Peter Knoop and Caitlin Dickinson of the University of Michigan for creating the Olynthos ArcGIS Online account and initial ArcGIS Collector maps of the site. I am also grateful to the University of Michigan for access to the Olynthos field data, ArcGIS Online and opportunity to work with the Olynthos Project. I am particularly grateful to Zosia Archibald for suggesting my involvement in the project, to David Stone and Lisa Nevett for collaboration on the GIS, to Bettina Tsigarida of the Ephorate of Pella and to the Hellenic Ministry of Culture and Sports for permission to investigate the site and their collaboration on the project. For more information about the Olynthos Project see the Project website. For fieldwork results to date see the forthcoming interim report Lisa C. Nevett, E. Bettina Tsigarida, Zosia H. Archibald, David L. Stone, Timothy J. Horsley, Bradley A. Ault, Anna Panti, Kathleen M. Lynch, Hannah Pethen, Susan M. Stallibrass, Elina Salminen, Sean Taylor, John Manousakis and Dimitrios Zekkos. Forthcoming. The Olynthos Project: Interim Report on the first three years of fieldwork (2014-2016). Annual of the British School at Athens. Purchased antiquities suffer from many problems. They lack useful archaeological provenance, are often forgeries and include recently looted objects that have been ‘laundered’ with fake provenances and spurious histories. These problems affect unprovenanced antiquities whenever they were purchased, but are particularly pertinent to those artefacts currently circulating and recently obtained. While there is a good argument to end the entire antiquities trade, at present it is legal to purchase archaeological artefacts provided they fulfill certain specific requirements. These requirements are intended to reduce the likelihood that the artefacts for sale were recently looted from archaeological sites or museums, and rely upon the stringent laws that the countries most affected by antiquities theft have enacted over the last decades. Historically (and particularly before 1950) the legality of purchasing or exporting antiquities varied greatly depending on their country of origin and thus there are ongoing legal and ethical debates about certain artefacts in museum and private collections. While these debates are illuminating, they are a large subject and do not have much bearing on the current legal framework or the myths that surround the modern antiquities trade. ‘Black market’ or ‘illegal’ antiquities are artefacts that do not meet the requirements, chiefly relating to provenance, that are intended to prevent recently looted or stolen antiquities from being sold legally. Illegal antiquities are obtained and sold against the laws of the countries that they came from and, depending upon their precise provenance and transit routes, their purchase may also contravene the laws of various intermediate countries and country of the purchaser. The extent of the black market trade in antiquities has recently been emphasised by publicity over the US firm Hobby Lobby’s purchase of illegal antiquities to stock the owner’s Museum of the Bible. There is no dispute about the black market origin of these objects and Hobby Lobby has agreed to pay the US government $3 million in fines and forfeit the objects. The extensive press coverage of the Hobby Lobby case is due to interest in the company following an unrelated Supreme Court victory relating to their employee healthcare package. But the publicity provides an opportunity to revisit the stale arguments and myths about black market antiquities purchases. It is rare to find all of these myths deployed at once (although at least one article supporting Hobby Lobby manages to use all of these arguments, even those that are mutually exclusive), but they recur in various combinations whenever someone tries to justify purchasing or publishing black market antiquities. Black market antiquities and the looting of archaeological sites. It is widely recognised that removing artefacts from archaeological sites without proper excavation, recording or archaeological analysis destroys vast amounts of scientific information and the knowledge of the ancient world that this would undoubtedly produce. This destruction affects both the antiquities sold on to the open market without provenance and other artefacts, structures and deposits removed with the antiquity and then discarded, which could otherwise contribute to scientific knowledge. Those who wish to justify the the purchase of black market antiquities often argue that their purchases do not contribute to the ongoing looting of archaeological sites in an attempt to minimise or justify their actions. Myth 1: Purchasing antiquities improves the prospects for their protection by increasing their value, raising incentives for the protection and conservation of antiquities, museums and archaeological sites. This repellent argument assumes that many countries won’t bother to protect archaeological sites or curate museum collections unless the objects in them have a high market value. So, goes the argument, purchasing antiquities raises their value and encourages the protection and curation of archaeological sites and collections. Leaving aside its patronising and racist overtones, the archaeological problem with this argument is that it completely misunderstands the nature of antiquities. It views archaeological artefacts like diamonds, precious objects dug out of base rock whose value depends entirely upon the market’s appetite for them. Antiquities are not diamonds. They are not dug out of base rock, but out of archaeological sites. Their archaeological context contains information of general scientific value and other data that is directly pertinent to the antiquity, all of which is lost when an artefact is looted. Black market artefacts (whether originally from a museum or an archaeological site) are typically sold either devoid of provenance or with a fake provenance, and information of direct relevance to the object is lost. This includes basic information like its original location (from the general site where it was found to the specific layer, building etc), period, date and whether it was found with any other objects that might together reveal more about it. Five Amarna letters on display in the British Museum (1: EA 29831; 2: EA 29848; 3: EA 29832; 4: EA29855 and 5: EA 29844). The Hobby Lobby case included a large number of clay tablets with cuneiform writing. Amongst the most famous such tablets are the Amarna letters (see above). These are a group (or assemblage in archaeological parlance) of clay tablets with cuneiform writing that were found in the Egyptian city of Aketaten (the site of which is known as Amarna). Although there is some uncertainty (and dispute) about how the letters found their way into certain museum collections at the end of the 19th century, sufficient numbers of them were excavated from Amarna to provide the secure archaeological context that gives them such great scientific value. They are dated to the reign of the Pharaoh Akhenaten of the 18th Egyptian Dynasty, who ruled in the 14th century BC during the Egyptian New Kingdom (in the Late Bronze Age). Their original location is known, the site (Amarna), general (administrative) area of the city and, in some cases, the specific buildings. The Amarna letters can also be associated with each other as an assemblage, making it possible to use information in different tablets to build up a better picture of Egyptian foreign policy during this period. If the Amarna letters were found today (or stolen from museum stores) and sold individually on the black market, much of this information would be lost. They would be given a spurious provenance or no provenance at all. We probably wouldn’t know which country they came from (since many sites across the ancient Near East were involved in exchanging such letters), much less which site or building, and we wouldn’t know which of them were found together and which were found hundreds or thousands of miles away. As a result their contribution to our understanding of the ancient world would be much reduced, even though the actual artefacts would survive. Proponents of this myth fundamentally misunderstand the nature of archaeological artefacts. Unlike diamonds a key element of the value (both scientific and economic) of antiquities is their provenance. The more precise that provenance, the more can be learned from an artefact. Those who purchase black market antiquities that have been stripped of that provenance through looting from an archaeological site or theft from a museum, are not increasing but destroying the value of those objects and any others that are removed (deliberately or accidentally) at the same time. An additional problem of the lack of provenance associated with black market antiquities is that it leaves room for fakes to enter the market. Fakes have always been a problem for collectors and there have been a number of high-profile cases where even artefacts purchased through legal channels have been identified as fakes. Black market objects carry an even greater risk of forgery. Furthermore, antiquities with a religious theme are particularly popular with forgers and those with religious motives are often targeted by them, perhaps because the desire to believe they are genuine outweighs caution amongst certain purchasers. Recent examples include the various biblical forgeries perpetrated in upon scholars over decades by Oded Galan and the famous Gospel of Jesus Wife debacle. Not only have Hobby Lobby reduced the scientific and economic value of the artefacts they purchased, they placed themselves at risk of being duped by forgers. Myth 2: Black market antiquities are not looted from archaeological sites, but only come from museums that have been destroyed or looted during conflict. Aside from the desperate desire of some to argue that purchasing black market antiquities has no effect on looting, this myth may also be a result of ignorance of the amount of archaeological material still left in situ at sites across the world. Given the long period of research across many areas, especially in the Middle East, some people find it hard to believe there is anything left in the ground. It is certainly possible that some black market antiquities (including some of the clay tablets and bullae purchased by Hobby Lobby) were originally looted from museums. But one of the main problems with purchasing black market antiquities is that it’s completely impossible to know where these objects came from. Many, if not all, black market antiquities from the ancient Near East are likely to have been looted recently from sites in Iraq and Syria. The scale of the looting that has taken place is unprecedented. This has prompted researchers like Sarah Parcak and groups like EAMENA and the Trafficking Culture group undertake research into the extent of looting. Their work has been widely reported and even prompted the creation of the Global Xplorer platform to crowd-source the recording of evidence of looting in satellite imagery. The Syrian site of Dura Europos in 2004, showing the city walls, grid-iron pattern of streets and some excavated areas. You don’t have to be a professional archaeologist to see this. A quick review of a famous site in Google Earth over time can reveal the extent of the damage to anyone with a computer. The first image (above) shows the ancient site of Dura Europos, on the Euphrates river in Syria in December 2004. The grid-iron layout of the ancient streets is clearly visible, as are the city walls and a number of excavated buildings. In the second image (below) from March 2015 the pock-marks of looting are clearly visible across the entire site. And they don’t appear randomly located either, there is a systematic pattern to them like a grotesque parody of an archaeological grid, indicating that this was regular systematised looting that probably involved a large number of people. It is highly likely that some of the bullae and tablets purchased by Hobby Lobby were extracted during this type of looting, at one or many sites across Iraq and Syria. Dura Europos in 2015, showing substantial looting in the centre of the city (just below the ‘s’ of ‘Dura Europos’) and the regular pock-marks of systematic looting across the town and in the extra-mural area to the left. The evidence is very clear that looting of archaeological sites is ongoing and serious. Artefacts uncovered by looters are clearly selling on the black market. Although the precise origin of any individual black market antiquity is usually uncertain because it is in the nature of that market that objects are sold without provenance, or with fake provenances, it’s simply ridiculous to suggest that purchasing black market antiquities has no impact upon the looting of archaeological sites. Myth 3: Buying looted antiquities ‘rescues’ them from the black market and from people who might otherwise destroy them (if they are inconvenient in size or location) or remove them from public appreciation. Others accept that purchasing black market antiquities contributes to the looting of archaeological sites, but argue that it is a necessary evil . Otherwise, so the argument goes, these objects would be lost to both science and the public either through destruction or by entering private collections. This argument is often deployed if (like Hobby Lobby) the purchaser wants to put black market antiquities on public display in a museum; if the artefact was formerly in a state with a regime disliked by the purchaser; or if the artefact was found by chance and would have been destroyed. Black market artefacts are not puppies. They did not stray and were not abandoned by their owners. Whether from a museum or an archaeological site they have been stolen and like any stolen property should be returned to their rightful owners. Those rightful owners are the people of the country where the museum or archaeological site is located. It is immaterial whether you like the government of that country because archaeological artefacts are not the property of the ruler of a country (whether an autocrat or an elected government). Rulers and governments come and go, but museum artefacts are intended to be available for generations to admire, research and learn from. This is why so many individuals in the archaeological and museums community were so angry at the sale of the Sekhemka statue by Northampton Museum. The statue was sold by the local authority under whose purview the museum came and who treated it as if it was their property, when it rightly belonged to the present and future population of that town. (Ironically the Sekhemka statue was undoubtedly looted from an archaeological site in the 19th century, an age when the purchase and export of antiquities was legal and before the current stringent antiquities laws came into force). Countries that are recovering from shattering wars are in particular need of sites and artefacts that can be used to renew social pride, teach new generations of scholars and attract tourists. Those who have considerable financial resources and a genuine interest in ‘rescuing’ archaeological objects should work with the many archaeologists seeking to protect cultural heritage and seek out and return looted artefacts to their countries of origin. Those who purchase a black market antiquity, whether to keep in a private collection or display in a museum are not rescuers, they are receivers of stolen property. Myth 4: Purchasing looted antiquities is a victimless crime because nobody gets hurt. This myth is often deployed in conjunction with one or more of the earlier ones to argue that purchasing looted antiquities is a necessary evil, which does little archaeological damage and is a victimless crime. Tell that to Khaleed el-Asaad, the archaeologist murdered in Palmyra in 2015 because he refused to give up the location of the most valuable antiquities. Or to the two guards murdered at Deir el-Bersha in Egypt by gangsters who came looting. These are just two of the most egregious examples, but many other local people, archaeologists, guardians and site workers have been threatened, injured, coerced and exploited by those seeking to loot archaeological sites and museums. Like any illegal trade black market antiquities attract people who are happy to operate outside the law. This is includes gangsters, mafiosi, criminals of all kinds, and terrorists. Such people do not generally respect labour or property laws so the ordinary people who find artefacts or who live and work where sites are located are often exploited and threatened. Those who do the hard and dangerous work of looting may not get paid at all and if they do it will be a tiny faction of price ultimately paid for an antiquity. Most of the money made from the illegal trade goes to the various criminals, gangsters and terrorists with the connections to sell on black market antiquities, who use it to continue their various criminal enterprises, exploitation, abuse and murder. As has been pointed out, this is not just about the group known as ISIS, although they have certainly profited from looted antiquities. Many other unpleasant groups and individuals, criminals and gangsters gain from black market antiquities all over the world. Purchasing black market antiquities is not a victimless crime, it puts money in the pockets of ruthless criminals of all kinds and encourages their continued exploitation, coercion and, sometimes, murder of ordinary people and archaeologists. Buying antiquities, whether on the black market or legally, is always a risky business. Whatever myths purchasers tell themselves, most black market antiquities are looted from archaeological sites, destroying precious scientific information. Purchasing them only encourages further looting and removes them from their legitimate owners, the people of the countries which originally contained or displayed them. And buying from criminals puts money in the hands of murders, and forgers. No matter how exciting an object is, it’s never worth buying an illegally obtained antiquity on the black market. This post comprises a review of the Cuban collection of Egyptian antiquities housed in the Museo Nacional des Belles Artes, in Havana. I visited the collection on the 24 May 2017. The museum is easy to access in central Havana, close to the Capitol and major tourist areas. Entry to the Asturian Building, which houses the Egyptian and other Old World antiquities collections, was four Cuban Convertible Pesos (CUC) when I visited (one convertible peso is equivalent to one dollar). The 2015 guide to the Egyptian collection was a further 20 CUC, but is well written in Spanish and English and was certainly worth the investment. Despite some minor issues with the display, the Egyptian collection contains some real gems and is not to be missed if you happen to be visiting Cuba. The Egyptian collection of the Cuban Museo Nacional des Belles Artes is housed in Havana in the building once belonging to the Asturian Society of Havana. This is a large and beautiful building close to the Capitol, where the 114 pieces of the Egyptian collection share a large hall with the Greek, Roman and Etruscan antiquities. Antiquities collected by Joaquin Guma Herrera, Earl of Lagunillos form the core of the Egyptian collection, supplemented by some small subsequent donations. These later donations include a predynastic Naqada II vessel and 25th Dynasty lapis heart scarab donated by Christian Loeben, curator of the Museum August Kestnet of Hannover, and a Third Intermediate Period coffin and cartonnage donated by the Republic of Egypt in 1974. The Earl of Lagunillas’ collection was donated to Cuba in 1955 and first displayed in 1956 with the assistance of Professor Francisco Prat Puig of the Universidad de Oriente. After the revolution of 1959 the museum was reorganised and became a Museum of Fine Arts. The collection was reorganised again and moved to its current location by architect José Linaresin in 2001. The Asturian Building (below) is a beautiful structure and the Egyptian antiquities are housed in a hall where Asturian Society gatherings once took place. Although the hall is beautiful, information about the exhibits is limited. There are no accession numbers on the labels, which typically only include date, material, object type and case number. Where relevant the labels also include those ancient individuals named or represented on the object. Unfortunately the museum has a strict policy against photography so I am unable to provide images of the objects as exhibited. The Asturian Building of the Cuba Museo Nacional des Belles Artes, Havana. Author photograph. Sadly the exhibits in the museum aren’t laid out either thematically or chronologically. In one case a Roman period stela, Roman bronze statues of Osiris and Isis and several scarabs of earlier date sit next to canopic jars from the Middle and New Kingdoms. Other bronze statues of divinities are located in a different case in another part of the exhibition, and stelae are scattered across several cases with relief fragments from multiple periods. This apparently haphazard approach to display may be due to a current reorganisation. Some pieces were absent and work was clearly ongoing when I visited. The lighting could also do with improvement. The signage would benefit from more background information for the casual tourist and the inclusion of interesting aspects of the antiquities (such as detailed provenance and links with pieces in other museums) that have been discovered by the authors of the recent catalogue (see below). The present situation does not do justice to the quality of the objects, but hopefully ongoing restoration and future redisplay will provide a remedy. Happily much more information, including the accession numbers and some excellent pictures of the objects, can be found in the accompanying catalogue (Sosa et al. 2015). The images (by David Rodriguez Camacho of Fotografo Arte) are particularly good, well laid out and very clear, and combined with images of objects from other collections as necessary. This is particularly useful given the occasionally poor lighting in the gallery. In addition to the images, the catalogue provides useful information for both the casual visitor and those needing more details of provenance and the origins of the collection. After describing the history of the collection, the catalogue is laid out thematically. Each section provides background information regarding the objects presented in it, and there is enough in these sections for the non-specialist to understand the context of the artefacts in the exhibition. Meanwhile experienced Egyptologists will find considerable information about each artefact in the well-researched catalogue entries. So thorough were the authors that even though almost all the artefacts in the museum were purchased on the open market and had minimal provenance, several catalogue entries describe the tombs or temples where the objects originated, thanks to dogged archaeological detective-work. A prime example are the three fragments (MNBA Havana 94-25, 94-26 and 94-27) from the tomb of Irenakhti/Irenptah/Iry, which were purchased without provenance by the Earl of Lagunillas and subsequently identified as coming from tomb G 2391 at Giza, south of the causeway to Khafre’s pyramid. Gneiss statue of 12th Dynasty Pharaoh Senusret I, similar to the granodiorite head in the Cuban Museum (Berlin ÄM 1205). Author photograph. As the catalogue makes clear, the Egyptian antiquities in the Museo Nacional des Belles Artes are a fine example of a mid-20th century private collection. There are shabtis, scarabs, fragments of relief (mostly from false doors), stelae, statues and statue fragments, Greco-Roman period encaustic mummy portraits, canopic jars, a wooden coffin and mummy cartonnage, and a range of Late Period bronze statues. So far so typical! But a list of what are, Egyptologically speaking, the ‘usual suspects’ doesn’t do justice to their quality. Many of the antiquities are very good examples of their type, well preserved and beautifully made. The knowledge of the experts (notably Bernard von Bothner and William C. Hayes) whom the Earl of Lagunillas consulted on his purchases, is evident in the quality of many of the pieces. The Cuban collection also contains several real gems. There is a very fine small relief of Seti I (MNBA Havana 94-36), and the head of a granodiorite statue of a Pharaoh (MNBA Havana 94-37) that has been identified as Senusret I of the 12th Dynasty. Although somewhat damaged it is physically similar to other images of that Pharaoh such as BM EA 44 and Berlin ÄM 1205 (above left) and an important addition to the corpus of Middle Kingdom royal statuary. Late Period head of Amun (MNBA 94-120) after Sosa (et al. 2015, 73). Both Seti and Senusret are trumped by a black basalt head of Amun (MBNA Havana 94-120) that has become the emblem of the collection. Its photograph (right) is a good exemplar of the quality of the imagery in the catalogue, which more than compensates for the inability to take photographs in the gallery. Dating from the Late Period, this Theban statue fragment has two different surface treatments. The flesh is highly polished, while the crown is coarsely pecked, probably to take a covering of a different material. Traces suggest it was once covered in gold, although other precious stones, metals or inlays may have been used for different elements. The head has been matched to a body in the Louvre (E 12988), which was found during excavations in 1927, attached to the north wall of the corridor on the west side of the temple at Medmud. The archaeological context suggested that the piece was broken when Coptic extensions were made in the temple. Other key objects in the collection include two reliefs that have been matched with other known fragments. MBNA Havana 94-35 is a beautiful polychrome fragment from the tomb of Neferu (TT 319), wife of Mentuhotep II. The fragment in Havana matches a photo in the Theban Expedition Journal from the 1925-6 season of the Metropolitan Museum excavations at Deir el-Bahri, but the artefact shown in the Journal has not been located. The catalogue authors suggest that it may be in Cairo. More interesting for aficionados of British Egyptology is MBNA Havana 94-15, an 18th Dynasty scene showing the purification of the deceased outside the tomb (below right). This piece has been matched with one in Birmingham Museum (n. 68866) and the combined image shows a typical New Kingdom scene of mourning before the tomb. Sadly the tomb is unknown as both reliefs were purchased on the antiquities market, but the style suggests it came from Saqqara. Line drawing from Sosa (et al. 2015, 128) showing MNBA Havana 94-15 (right) combined with it’s partner Birmingham n. 68866 (left) to form a typical mourning scene of offering to and purifying the deceased. One exception to the purchased artefacts is the 22nd Dynasty coffin and cartonnage of Tashebet (MNBA Havana 94-39), excavated by Labib Habachi from the tomb of Kheruef (TT192) in the Asassif. This beautiful coffin-set was donated to Cuba by Egypt in 1974, in gratitude for Cuba’s assistance with the archaeological work required by the construction of the Aswan High Dam. Both coffin and mummy case are beautiful examples of Third Intermediate Period work. Complementing Tashebet’s coffins is the Book of the Dead of Bakenweren (MNBA Havana 94-47), which dates to the same period and was found or purchased by William Franklin Hood in Luxor in 1858. It passed through the collections of William Randolph Hearst and Joseph Brummer before being purchased by the Earl of Lagunillas in 1949. Like the other artefacts it is a lovely example of its type and is well-covered in the catalogue (see the featured image above). Among the many other artefacts special mention must be made of a bronze and paste Uraeus (MNBA Havana 94-115), dating from the Late Period and probably attached to a white or atef crown. A Ptolemaic coffin of a falcon (MNBA Havana 94-56) is also worth noting for its similarity to examples of animal coffins from the recent Manchester Museum Animal Mummies exhibition. Of the many Egyptian alabaster jars in the collection, it is likely that MNBA Havana 94-82 and 94-87 originated in the Hatnub quarries, which were very active in the 11th Dynasty when these artefacts were made. Another alabaster cosmetic jar still contains the oily remains of its original cosmetic or unguent (MNBA Havana 94-89) and would be a prime candidate for further scientific investigation. Among the stelae there is a good example of a ‘hearing ear’ stela (MNBA Havana 94-30) with carved ears to help the invoked god hear the prayer, and a polychrome Roman stela without text (MNBA Havana 94-13). The Cuban collection of Egyptian artefacts in the Museo Nacional des Belles Artes is a fantastic small collection. The small defects in its display (which will hopefully be rectified soon) do not detract from the quality of the objects individually and as a group, or their important relationships with other 20th century collections. The collection catalogue is a fantastic example of its type, with enough background information for the causal visitor as well as detailed information on individual objects, their provenance, relationships with other pieces and international ties. If you happen to be visiting Cuba, the Egyptian collection should definitely be on your list, and if you are able to obtain a copy of the catalogue (which sadly appears rarely on the usual websites) it’s well worth doing so. Sosa, M. A. Lastra, A. C. and Morfini, I. 2015. La Coleccion Egipcia del Museo Nacional des Belles Artes de la Habana. On 30 January of this year, Sarah Parcak, winner of the 2016 TED Prize launched the Global Xplorer platform she has created with her prize money. Like the many archaeological crowd-sourcing projects on the Micropasts website, Global Xplorer is a crowd-sourcing platform allowing members of the public to take part in archaeological satellite remote sensing from their laptop, phone or tablet. The heady combination of Sarah Parcak, National Geographic’s own ‘Space Archaeologist’, a TED prize, archaeology and satellite technology has prompted a number of media outlets to report on Global Xplorer, from Forbes to The Guardian. All this publicity means that interested members of the public will soon be working through the imagery on the platform. But the thought of anyone with a computer logging on to archaeological sites has not been universally welcomed. This recent article on the Cairo Scene website, which has been publicised on social media by the Egyptian Cultural Heritage Organisation, argues that Global Xplorer could be used by looters to identify targets, making the situation worse in countries where protection for antiquities is limited. As someone who works with satellite imagery, I decided to test out Global Xplorer and see if these concerns are justified and provide general review of platform. Global Xplorer is a straightforward platform. There are several pages of information about the project with videos from Sarah Parcak. Archaeological and cultural details of the countries covered can be found under ‘Expedition’, and there are also areas for donations and FAQs. So far only data from Peru has been included on the platform. Before you can begin working on satellite imagery you need to register, giving details such as name, email address and a password you generate. Then there is a tutorial explaining briefly what natural and archaeological features look like in satellite imagery and how to identify evidence of looting and avoid false positives. Once you’ve finished the tutorial you begin working on the tiles. It’s pretty clear that it would be almost impossible for tomb robbers or antiquities thieves to make use of Global Xplorer to further their nefarious activities. In addition to the off-putting effect of registration, the user only sees a very small area at any given time, and it is entirely divorced from any geographic context. The FAQs confirm my assumption that the tiles have no coordinates or other geographically identifying data, and the tiles you are shown appear in a randomised order so you couldn’t even associate what you’ve seen in the previous tile with what you see in subsequent ones. Within the tiles there’s very little information to assist you in identifying the location. Even if a pristine archaeological site appeared inside that white square, at best you might be able to discern it was in the rainforest, in a field or in the desert and next to a building, road or river, but the sheer number of possible locations for each tile is immense. In fact the only way looters would be able to recognise an archaeological site is if they had already been there and were familiar with the terrain, and then we can hardly blame Global Xplorer for the looting. On the other hand Global Xplorer is quite good fun. It works on your phone or tablet, so you can cover a couple of tiles while waiting for the bus/train/plane. It’s very easy and straightforward and quite relaxing in a strange way. While currently the goal is to identify looting, the ‘Current Campaign’ menu at the bottom of image above suggests that users will move on to identifying ‘Encroachment’ and ‘Discovery’ as the programme rolls out. So if you have a few minutes and fancy trying it out, its straightforward to learn and easy to use, and you certainly don’t need to worry about antiquities thieves learning anything useful. In 2013 an Egyptian sphinx was discovered at the Biblical site of Hazor, in what is now northern Israel. It was inscribed with the name of Menkaure, fifth king of the IV Dynasty and owner of the third pyramid at Giza. On reading the reports of the discovery I was drawn to the stone from which the sphinx was made. Careful examination of the published photographs of the artefact reveal that the sphinx was made of a stone comprising dark blue and black bands in a light off-white matrix. These colours and patterning are typical of Gebel el-Asr gneiss; comparable examples of gneiss are featured in my earlier post ‘When diorite is gneiss’, have been published by James Harrell’s website, and examples are visible on the Petrie Museum website. Egyptian objects made from examples of similarly coloured gneiss are shown below. The intact bowl (UC17722) and the broken bowl with a cartouche of King Khaba (UC15800) both date to the III Dynasty, other fragments (e.g. 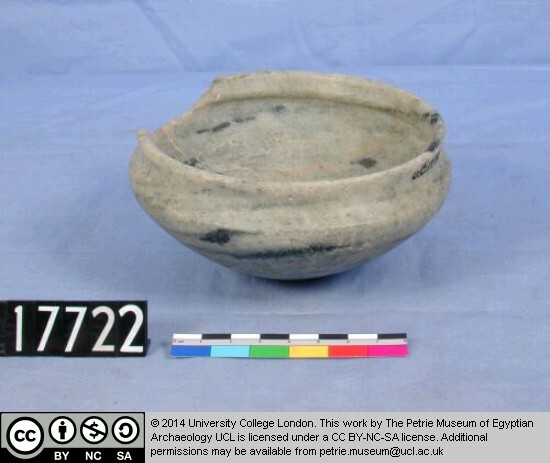 UC72412) from the Petrie Museum date to the IV Dynasty and come from Giza. 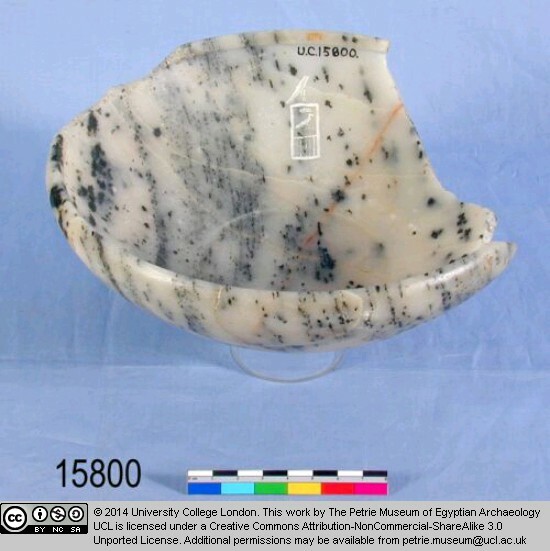 Gneiss bowl in the Petrie Museum (UC15800). Confirmation of the stone used to produce the sphinx must await further analysis of the artefact, but it is well known that the Gebel el-Asr quarries were exploited during the Old Kingdom and particularly by the IV Dynasty pharaohs. Gneiss stone vessels have been found in royal tombs from the I Dynasty onwards. A gneiss stela of the II Dynasty Pharaoh Peribsen was found at his tomb at Abydos and is now in the British Museum (EA35597). Gneiss floor tiles were employed in the III Dynasty Step Pyramid of Netjerikhet Djoser. During the IV Dynasty large statues were produced in gneiss, including the famous example from the funerary complex of Khafre that is now in the Cairo Museum and was featured in a previous blog on this site (http://wp.me/p4wCoi-1g) . There is also considerable evidence of Old Kingdom activity at Gebel el-Asr, including stelae left at the site by the expeditions (http://www.antiquity.ac.uk/projgall/Pre2003/ShawI/shawi.html). Gneiss vessels were even found in the pyramid complex of Menkaure, the IV Dynasty Pharaoh, who also dedicated the sphinx found at Hazor. The inscription and original location of the sphinx are also interesting. The excavators suggest that the Hazor sphinx was originally set up at Heliopolis (known as Iunu to the Egyptians), close to modern Cairo. They suggest it was later removed to Hazor in the second millenium BC by either the Canaanite Hyksos kings, who ruled the northern part of Egypt during the Second Intermediate Period; or the subsequent New Kingdom Pharaohs, who controlled much of Canaan. 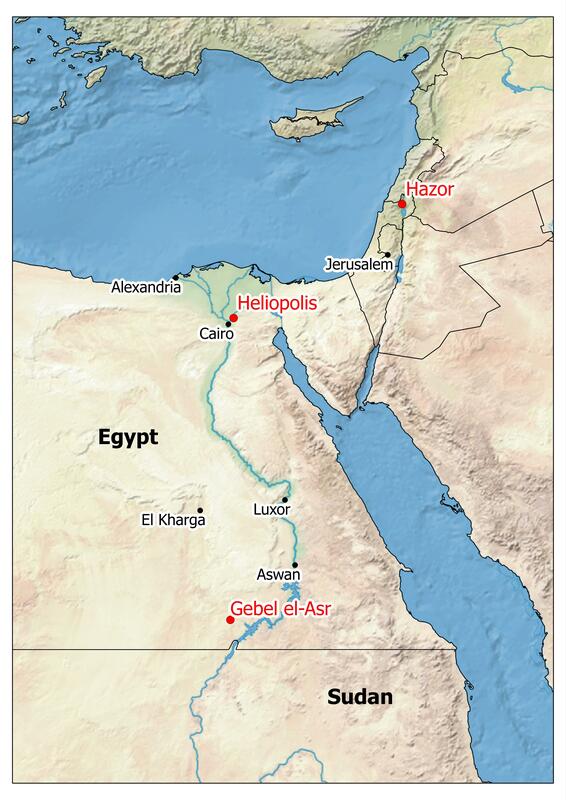 Heliopolis was the associated with the cult of Ra, the sun god, who became increasingly important during the IV Dynasty. For the first time in Egyptian history, IV Dynasty Pharaohs had names incorporating the name of Ra. Djed-f-Ra, Kha-f-Ra and Men-Kau-Ra all had names compounded with Ra and DjedefRa was the first to use the title ‘Son of Ra’, which was later employed by every pharaoh. The true pyramids of the IV Dynasty have also been associated with solar religion, and the succeeding V Dynasty took this a stage further with the creation of sun temples in addition to their pyramid complexes. The increasing use of gneiss for statuary in the reign of Khafre, may reflect the same interest in solar religion. The excavators of Gebel el-Asr, Engelbach and later Harrell and Brown, noted that the gneiss had a distinctive blue glow in the sunlight. Harrell and Brown suggest that this luminosity made the stone particularly attractive to the Egyptians. Given that the Egyptians attributed divine powers to certain stones and equated them with various divinities, it would not be surprising if the luminosity of the gneiss acquired solar associations. This would make a gneiss sphinx a particularly apt gift for Menkaure to provide for the solar cult centre of Heliopolis at a time when solar theology was in the ascendant. For gneiss stone vessels in the Early Dynastic period and Old Kingdom generally see Aston, B. G. 1994. Ancient Egyptian Stone Vessels: Materials and Forms. Studien zur Archäologie und Geschichte Altägyptens 5. Heidelberger Oreintverlag, Heidelberg. For specific reports of gneiss vesssels found in Early Dynastic and Old Kingdom tombs see Firth, C. M. and Quibell, J. E. 1935. Excavations at Saqqara: The Step Pyramid. Cairo, Service des Antiquités de l’Égypte; pages 140, 180 of Reisner, G. A. 1931. Mycerinus. Cambridge Massachusetts, Harvard University Press; and page 13 of Petrie, W. M. F. 1901. The Royal Tombs of the Earliest Dynasties Part II. London, Egypt Exploration Fund. For the gneiss floor tiles in the Step Pyramid see pages 105, 127, 193-5 of Firth, C. M. and Quibell, J. E. 1935. Excavations at Saqqara: The Step Pyramid. Cairo: Service des Antiquités de l’Égypte. For the archaeological evidence of Old Kingdom exploitation of Gebel el-Asr see Engelbach, R. 1933. “The Quarries of the Western Nubian Desert: A Preliminary Report” ASAE 33: 65 – 74; Engelbach, R. 1939. “The Quarries of the Western Nubian Desert and the Ancient Road to Tushka” ASAE 39: 369 – 390; and the interim report on the Gebel el-Asr project work in Shaw, I. Bloxam, E. Heldal, T. and Storemyr, P. 2010. Quarrying and Landscape at Gebel el-Asr in the Old and Middle Kingdoms. In: F. Raffaele, M. Nuzzolo and I. Incordino (eds.) Recent Discoveries and Latest Researches in Egyptology: Proceedings of the First Neapolitan Congress of Egyptology, Naples, June 18–20 2008. Wiesbaden: Harrassowitz-Verlag. 293–312. For the geological investigation at Gebel el-Asr and the luminosity of the stone see Harrell, J. A. and Brown, V. M. 1994 “Chephren’s Quarry in the Nubian Desert of Egypt” Nubica 3.1: 43 – 57. For the sun cult in general see Quirke, S. 2001. The Cult of Ra: Sun-worship in Ancient Egypt. Thames and Hudson. For the names of the Pharaohs and their meanings see Quirke, S. 1990. Who were the Pharaohs? A History of their names with a list of cartouches. British Museum Press. For the pyramids in general see Lehner, M. 1997. The Complete Pyramids. Thames and Hudson. For the sun temples of Abusir see Bárta, M. Coppens, F. and Krejčí, J. (eds), Abusir and Saqqara in the year 2010 Prague: Czech Institute of Egyptology, Faculty of Arts, Charles University in Prague. They are also covered briefly, with references, in Wilkinson, R. H. 2000. The Complete Temples of Ancient Egypt. Thames and Hudson: London. For the relationship between stones and divinities see Aufrère, S. 1991. L’Univers Minéral dans la Pensée Égyptienne. Institut Français d’Archéologie Orientale du Caire: Cairo; Aufrère, S. 2001. “The Egyptian Temple – Substitute for the Mineral Universe.” In: W. V. Davies (ed.) Colour and Painting in Ancient Egypt. British Museum Press: London. 158 – 163. For a specific case concerning turquoise see Valbelle, D. and Bonnet, C. 1996. Le sanctuaire d’Hathor maîtresse de la turquoise. Paris: Picard Editeur. See also treatments of magic and ritual in ancient Egypt such as Pinch, G. 1994. Magic in Ancient Egypt. British Museum Press: London; Pinch, G. 2001. “Red Things: The Symbolism of Colour in Magic.” In: W. V. Davies (ed.) Colour and Painting in Ancient Egypt. British Museum Press: London; Wilkinson, R. H. 1994. Symbol and Magic in Egyptian Art. Thames and Hudson: London. Gneiss objects from the Petrie Museum of Egyptian Archaeology, UCL, on a Creative Commons Attribution-NonCommercial-ShareAlike 3.0 Unported license.